If a newspaper in the USA were to take an editorial stand on an Australian election, residents on both sides of the Pacific would probably find that nothing less than extraordinary. But such is the fascination with American politics – and the implications for Australia – that The Sydney Morning Herald recently made a public editorial statement in favour of Barack Obama’s re-election (“An America Where Being Reasonable is Audacious”, October 25, 2012). Living in Sydney, Australia, I usually find “The Australian’s” international news coverage to be refreshing and valuable, despite the paper’s adamantly right-wing rhetoric on many topics. But the paper’s readers are being let down by its North American correspondent Brad Norington’s coverage of the American presidential election (“Obama does the business on jobs”, Monday October 29, 2012, p.12). 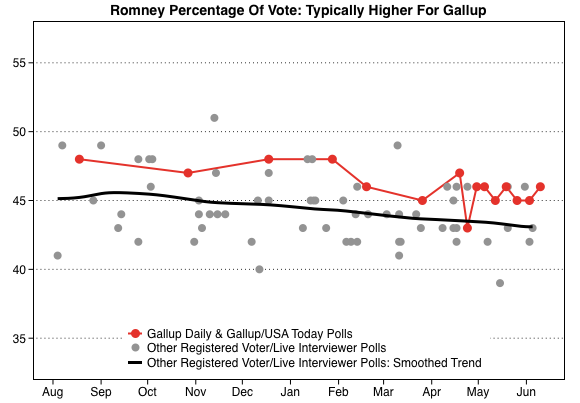 Norington continues to quote the Gallup Poll figures, which indicate Romney ahead of Obama by five or more percentage points. This is seriously misleading, and when Obama wins next week – as he most likely will – readers will wonder why they kept thinking Romney was in the lead. Both Nate Silver in “The New York Times” and Mark Blumenthal in “The Huffington Post” have comprehensively shown that the Gallup Poll figures have been the most skewed “house effects” towards Romney of any of the many American polls, and are almost certainly incorrect. Yet Norington persists in quoting the Gallup figures first – and sometimes solely. This selective quoting indicates either a political (pro-Republican) bias or an ignorance of the real state of the American voting intentions. In either case, it does both the paper and its readers a major disservice. I attach below two tables taken from Blumenthal’s June 18, 2012 analysis (“Race Matters: Why Gallop Poll Finds Less Support for President Obama”). 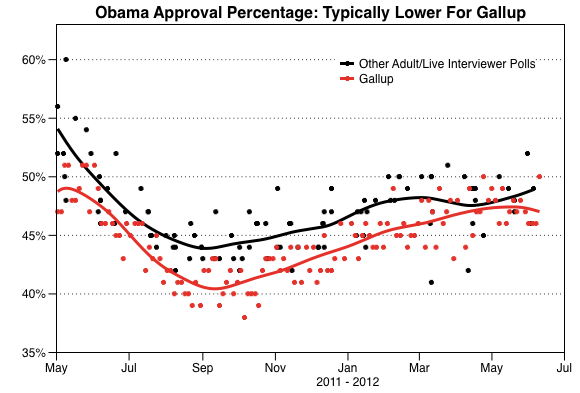 The first one shows how the Gallup systematically undercounted Obama’s approval percentage for a full year from May 2011 to June 2012. On June 12, 2005, Steve Jobs, the co-founder, Chairman and CEO of Apple Inc, gave the Commencement Address at Stanford University in the USA. You can read the full address and watch the video of it here. In his address, Jobs talked of his diagnosis of cancer in 2004 and how he battled it. As we all know, Jobs died on October 5, 2011. That he died so relatively young makes his address even more poignant. In it, Jobs reminds us what really matters. I have included an extract below as a reminder to us keep perspective and think of the things that truly matter. With the imminent launch of the Cockatoo Island Film Festival – an astonishingly lavish production commencing in Sydney Harbour on 24 October 2012 – it is time to publish my review of “Russian Doll”. This film was directed by Stavros Kazantzidis, and written by Alanah Zitserman and Kazantzidis – the two Cockatoo Island Film Festival founders. This film review of “Russian Doll” appeared in the Australian Jewish News on 8 June 2001, and stars stars Hugo Weaving, David Wenham, Rebecca Frith, Sacha Horler and Natalia Novikova. The modern Australian-Jewish experience is not exactly a topic which is reflected on the big screen very often, so the release of “Russian Doll” was of particular interest. “Russian Doll” is a Bondi-based romantic comedy, the product of a collaboration by Russian-born Allanah Zitserman (who came to Australia as a refugee in 1980) and her film-making partner, Cyprus-born Stavros Kazantzidis. Hugo Weaving (“Proof”, “The Matrix”, also a co-producer on the film) plays Harvey, a (Catholic) neurotic and morose private investigator and aspiring detective fiction writer. The bread and butter of his business is husband/wife cheating cases (some neat set-up scenes here reminiscent of Gene Hackman in “The Conversation”), but Harvey soon discovers that one of the adulterers he is snooping upon is in fact his own partner. Harvey, already suffering from a self-esteem problem, is devastated. Meanwhile, young, pretty Russian-Jewish Katia (played Russian born NIDA graduate Natalia Novikova) has arrived in Sydney as a “mail order bride” set up through a Jewish matchmaking agency. She arrives at her intended’s flat and finds him dead from an apparent heart attack. Alone in the big city, she is be-friended by Ethan (David Wenham, of “Sea Change” fame), who is apparently happily married to Miriam (Rebecca Frith), and they soon become lovers. After months of the secret affair, Ethan is keen to keep Katia in Australia legally so approaches his best friend Harvey to propose a marriage of convenience with Katia. Traditional values Harvey is appalled, but soon succumbs to Ethan’s offer of financial support that will allow him to pursue his writing career full-time. So Katia moves in with Harvey in anticipation of their fake wedding. A number of unexpected problems arise: even though it is to be a fake one, Katia still wants a Jewish wedding; Miriam meets Katia and helps her plan a big event; and Katia’s noisy lifestyle interferes with Harvey’s desire for peace and quiet. Along the way, Katia introduces Harvey to Sydney’s Russian community, and he meets Latvian Liza (Sacha Horler), who in turn falls for him. As the web of relationships becomes even more tangled, the wedding day approaches. Although shot for a miniscule budget, “Russian Doll” is frequently funny, and remarkably and surprisingly entertaining. It had two Australian Film Institute nominations: for best original screenplay (which it won), and best supporting actress for Horler. The script is light, the direction and editing by Kazantzidis – who obviously understands the migrant experience – is deft; and the performances are enjoyable, particularly anchored by Novikova’s charming and very convincing Katia. “Russian Doll” breaks no new directorial or thematic ground, and there are lots of hints of Woody Allen influences (although nothing wrong with that). The pleasures in “Russian Doll” (particularly for eastern suburbs Sydney-siders) are in seeing the familiar on screen. Unlike the oh-so-obvious Sydney settings of “Mission Impossible II”, the world of Katia, Harvey and Ethan is a warm, intimate and everyday one (including scenes shot at Temple Emanuel Woollahra). And this is also a very Jewish movie: just about every character except Harvey is Jewish, with the Jewish elements flowing naturally from the script. It makes us realise that the Australian-Jewish experience certainly is one with modern stories worth telling on screen. Rebecca Frith does her Jewish character well, although many may debate whether David Wenham’s performance feels Jewish enough. One major plot criticism: no rabbi in Australia would marry the Jewish Katia to the Catholic Harvey without a formal conversion. That certainly would have provided some interesting script possibilities. Almost every year since 1969, Woody Allen has written and directed a film, creating one of the most extensive bodies of work of any living American film director. With a couple of exceptions (the 1977 Oscar-winning “Annie Hall” being one), his films have not made much money. But Allen’s impact on American film-making, modern American film romance and American film comedies in particular continues unabated. Allen’s 1999 film was “Sweet and Lowdown”, which inexplicably took almost a year to reach Australia (arriving just as his next film was being released in the USA). This film about a transient fictional jazz guitarist (Emmet Ray, played by Sean Penn) has not set the box office on fire and only lasted a few short weeks in Australian cinemas, so fans of the Woody genre had to hurry to see it. The tone of “Sweet and Lowdown” is a familiar one from Allen’s recent films: full of sly humour and a few belly-laughs, a bit romantic, a bit of action, lots of nice jazz music and a number of fractured love stories. It’s set in the 1930s, with lots of nicely evocative American scenes from the time (think “Radio Days” and “The Purple Rose of Cairo”). The problem with “Sweet and Lowdown” is mostly in the main character of Ray: He may be talented (“second-best guitartist only to that gypsy Frenchman, Django Reinhardt”), but he is also egotistical, mean, unlikeable, a kleptomaniac, a pimp and unfaithful to some very loving women. His favourite activities (aside from jazz guitar) are playing pool, shooting rats at the “dump” and watching trains. Sean Penn (who was nominated for Best Actor Oscar for the role) does a good job, but cannot rise above the character’s basic mean-ness and breathtaking self-centredness (think “Deconstructing Harry”). Penn does, however, successfully avoid looking and sounding like Woody Allen, unlike Kenneth Branagh in the previous year’s Woody Allen film “Celebrity”. Ray’s character is particularly set off by one of the three women who he hooks up with during the course of the film: a Harpo Marx-like Hattie (played by Samantha Morton, who also received an Academy Award nomination), a mute laundry woman with a round face. Every minute that Morton is on-screen is unforgettable; the world is reflected in her silent but deeply expressive face. This is a performance of exquisite beauty and unforgettable nuances. Also appearing in “Sweet and Lowdown” are cult screen director John Waters, Gretchen Mol and Anthony LaPaglia as a hoodlum who steals Ray’s wife Blanche (Uma Thurman). Allen uses his pseudo-documentary style technique to good effect, and a large number of African-American characters casually appear, unusual for Allen’s generally whites-only casts. Most scenes are carefully constructed, but somehow they do not all add up, with the whole of “Sweet and Lowdown” becoming definitely less than the sum of its parts. Even on a mediocre day, a Woody Allen outing is better than most films which show up in cinemas these days. By any account, Allen’s latest – “Small Time Crooks” (which unaccountably took more than six months to arrive in Australia) – is a minor film of the Allen repertoire, but will be essential viewing for his long-time fans. “Small Time Crooks” (2000) was also Allen’s first film since “Deconstructing Harry” (1997) in which Woody Allen also stars. This time he plays Ray Winkler, a New York working class, Jewish, small time schlemiel-like thief whose IQ appears to have a hard time breaking into the 90s. Not long out of prison, Ray works as a dishwasher and is married to Francis (“Frenchie”), a nail manicurist played by Tracey Ullman. It’s a small life, but Ray dreams big dreams, this time about robbing a nearby bank by tunnelling into the bank’s vault from the basement of a dis-used pizza restaurant nearby. They need a cover, so open a cookie shop with Frenchie baking her speciality cookies. After joining up with a crooked cop, the cookie business unaccountably becomes wildly successful, and all of wealth they once desired is theirs. But this is a story with a moral, and Ray and Frenchie are not really happy with the riches and the good life. While Ray just wants to retire to Florida, Frenchie wants to attain a new social standing befitting the money, so throws dinner parties for people who despise her and hires an art dealer (Hugh Grant) to teach her the finer points of life. Along the way, we are treated to lots of Woody Allen satire and commentary: of the nouveau riche, the emotional bankruptcy of wealth, the value of real friendship, the pretensions of the artistic elite, and the unpredictability of American faddish culture. It’s all good fun, but it does not amount to a very profound journey for its characters; it’s syrupy and slight (with a “G” rating even). The real enjoyment of “Small Time Crooks” comes in the characters and the acting – as good as, if not better than many of Allen’s more meaningful films. Ray’s band of crooks (Michael Rapaport, Tony Darrow, Jon Lovitz) are wonderfully inept, Hugh Grant plays himself with ease, and Allen’s ageing dumb crook character reminds us that he does indeed have an acting range. But the film’s most captivating moments come from Tracey Ullman and Elaine May (who plays Frenchie’s dimwitted cousin May). Ullman is one of the very best comic actors around, and here has a role with depth in which to shine (and may get her an Oscar). Elaine May is best-known for her work as a screenwriter (“Primary Colors”) and director, but here creates one of the most interesting characters seen in a Woody Allen film in a long time: so dumb she is almost smart. Elaine May footnote: Exactly a year ago (20 October 2011), a set of three one-act plays called “Relatively Speaking” opened in New York City’s Brooks Atkinson Theatre (I saw it not long after opening). The three plays were written by Woody Allen, Elaine May and Ethan Coen. In this New York Times piece from 13 October 2011, Elaine May interviews Woody Allen and Ethan Coen. Funny stuff! Although not quite a full return to form, traditional fans of Woody Allen will find themselves reasonably satisfied with his “Melinda and Melinda”, certainly his best film in seven or more years. While many elements do not quite work, audiences seeking a more cerebral film-going experience are not likely to be disappointed. The setting – as so much of the Woody Allen oeuvre – is an intellectual, Jewish, sophisticated theatre film and artistic crowd in Manhattan, with a few rich entrepreneurs (usually doctors) thrown in for variety. The storyline is not particularly profound, but gives two interesting settings for some of the best ensemble acting in some time. The film opens in a New York eatery, where four (obviously very intellectual) diners are discussing the nature of tragedy and comedy. Remember the line spoken by Alan Alda’s character in “Crimes and Misdemeanors” that “comedy is tragedy plus time”. It’s that sort of discussion – rich, intellectual, urbane and vaguely cynical. In this case, the writer of tragedy Max (Larry Pine) and the writer of comedy Sy (Wallace Shawn, as impish as ever and a playwright of some note in real life), both spin the same story about a young woman named Melinda, except one is a tragedy and the other a comedy. Thus follows two totally different but yet parallel stories, with the only connection being one character in common – Melinda, played astonishing well in both by Australian actress Radha Mitchell. (Mitchell is beautiful, versatile, has a great range, and is developing an extraordinary emotional pitch.) In each version, Melinda arrives unannounced at a New York City dinner party to an apartment where the husband is an aspiring actor and the wife significantly more accomplished professionally. Not surprisingly, in both instances, relationships begin to unravel and the nature of friendship is tested. In the tragic version, Melinda has a desperately dark past history and is arriving to the home of old university friends who have decidedly mixed feelings about seeing her again; in the comic version, she is subletting a flat in the same building and is on the verge of committing suicide. “Melinda and Melinda” is, if anything, over-plotted, but never less than engaging. Unlike some dual character films, the connections between the two Melindas are not quite strong enough to sustain continued relevance. Certainly their personalities are very different, so the point of parallel stories gets lost a bit. There are also some interesting casting choices. Experienced comic Will Ferrell (“Elf”, “Anchorman”) plays the comic aspiring actor in a role that sounds just like what we once thought of as “the Woody Allen character”, with all of the neuroses and self-deprecating lines. It’s an interesting take, but never quite worked for me to be hearing the ghost of Woody in a very different sort of body. The other interesting casting choice is British-born black actor Chiwetel Ejiofor (“Amistad”) as Ellis, the soulful piano player in the “tragic” story; this is the first complete black character I can recall Woody Allen putting on screen, and it works. Other cast members include British actor Jonny Lee Miller (“Trainspotting”), Amanda Peet (“Something’s Gotta Give”) and Chloe Sevigny (“Boys Don’t Cry”). Allen revisits many of his favourite themes (romance, jealousy, identity, you name it), but it’s only when he starts dealing with moral issues that “Melinda and Melinda” starts to take on a deeper meaning, when tragedy and comedy begin to merge in the uncomfortable style of his “Crimes and Misdemeanors”. The film does not quite get there, but it’s a good – and very watchable – attempt. You are currently browsing the Don Perlgut's Blog blog archives for October, 2012.